The 1960’s and 70’s brought with them significant changes to the profession of nursing. Arising from religious and military roots, nursing had long been viewed as a “calling” with service to others being a core value. Nurses had no recognized status and no recognized rights and were perceived by many, including hospital administration, as handmaidens to the physicians and thus were expected to do as they were directed. Nurses also had no legal protection and no code of ethics to guide their nursing practice. There were also no “scope of practice” guidelines so nurses often found themselves in positions of vulnerability as they were expected to deal with various situations even when they felt the duties did not fall within what they believed to be reasonable nursing practice or when they did not feel qualified to perform certain duties. Loyalty to the hospital and to the physicians regardless of the situation was the norm. There was also no job security for nurses as there were no established processes for hiring and no terms or conditions of employment or compensation. Many nurses were aware of the unfairness of these conditions. One of these nurse leaders, Vernita “Tut” Gallant, was determined to alter the status quo and she became a driving force behind the changes that were to come. Tut was a very active member of the Association of Nurses and a strong advocate for nurses’ rights especially relating to employment. She became the Chair of the Socio-Economic committee of the Association of Nurses and through that position she was able, with the help of others, to lay the ground-work for the establishment of a Nurses’ Union. This proved to be quite a challenge because of the conflict of values that existed at the time. Nurses were perceived by some as having roles similar to “sisters of charity” so the idea of a union where nurses would be concerned about their personal and professional welfare was considered self-centered and was frowned-upon by many including some nurses. But, there was no mountain too high for this group of determined individuals. As a result of these efforts, the Socio Economic Committee within the Association of Nurses of PEI was successful in reaching its goals and became the precursor to the Union. 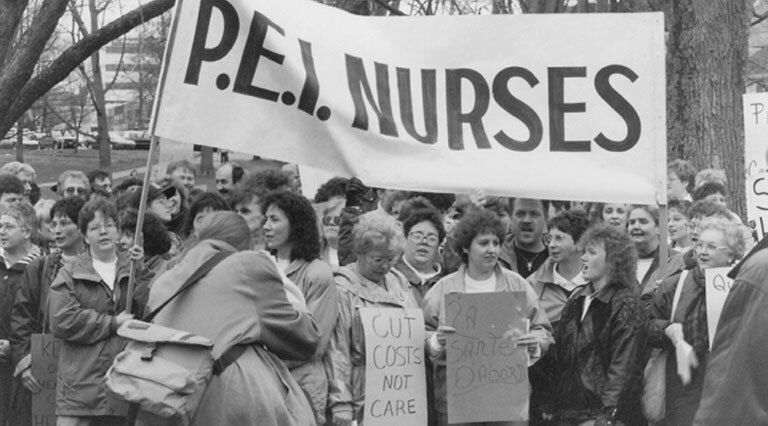 In April, 1974, the Prince Edward Island Nurses’ Act was amended to establish, within the Association of Nurses’ of PEI, the Provincial Collective Bargaining Committee (PCBC). The establishment of the Committee enabled Registered Nurses in PEI to bargain collectively for the first time. Tut became the first President of the Bargaining Committee. Christine Kavanagh (Reynolds) was hired in 1975 as the first Executive Director/Labour Relations Officer of the Provincial Collective Bargaining Committee. The National Federation of Nurses Unions (now CFNU and of which PCBC was a founding member) helped the process along. There was much education that needed to be done. Nurses had to be made aware of the role of the PCBC and how it could help them in terms of determining contract items. The whole idea of dues had to be broached and then implemented as well. There were many meetings held and questionnaires distributed throughout the institutions where nurses worked. At the time these included the PEI Hospital, the Charlottetown Hospital, the Prince County Hospital, the Western Hospital, the O’Leary Hospital, the Stewart Memorial, the Kings County Memorial, the Souris Hospital and the PEI School of Nursing. Nurse representatives from each of these nine areas (or “Staff Associations”) formed the provincial body that became the first Provincial Bargaining Committee for Nurses on PEI. At this time, the budgets for the School of Nursing and the hospitals came from the Hospital Services Commission. Medicare was introduced in Saskatchewan by Tommy Douglas in the 1960s. Up until then, patients had to pay to stay in the hospital so these patients were mostly the wealthy or veterans who had special support because of their service to their country. When the Hospital Services Commission came into being, they negotiated a deal with the Federal government who agreed to give transfer payments to the Province to help with health care expenses. The Hospital Services Commission then managed these funds for staff salaries so it was the Hospital Services Commission that PCBC was required to bargain with. The Hospital Services Commission senior staff as well as the hospital administrators were mostly male and were used to making their own decisions with respect to staffing and working conditions. Being required to negotiate these issues directly with nurses was a challenging and somewhat humbling process for many of them. On June 25, 1987, the Committee bid farewell to Christine Kavanagh, who was instrumental in shaping the union into the strong organization it had become. She helped achieve many fundamental improvements in benefits and working conditions. Nursing school diploma programs were closing and the university Baccalaureate program was becoming the standard. On September 7, 1987, after years of lobbying, the Labour Act of Prince Edward Island was amended to include Registered Nurses. With the amendment, bargaining rights were secured under the Labour Act and the PEI Nurses’ Union had formally evolved from an organization structured as a committee of the Association of Nurses of PEI (PCBC) to a fully autonomous union and the recognized bargaining agent. This change would provide greater autonomy, certain advantages to nurses in the collective bargaining process and better services to its 530 members. The Constitution of the Union was rewritten and a more democratic structure emerged. PEI was the last province in Canada to establish a Nurses Union. There was lots of talk surrounding Pay Equity and a brief stating the Union’s continuing support of the concept was presented by Betty MacFadyen, the first Executive Director of the Union, to the Special Committee on Legislative Proposals on October 9, 1987. Sandra Gordon, Head Nurse of the Ambulatory Care Unit at Kings County Memorial Hospital, was appointed to the Provincial Occupational Health and Safety Committee. Rebecca Gosbee, Clinical Nurse Specialist at the Queen Elizabeth Hospital was appointed to the Provincial AIDS Advisory Committee. Betty MacFadyen was appointed to the Labour Relations Board. These appointments were an indication that the government was beginning to give nurses an opportunity to participate and express their concerns in matters important to them. Meetings were held in December to discuss the possibility of moving from office space at 92 Queen Street shared with the International Union of Operating Engineers to a new building to be constructed by IUOE. The Union moved to Kensington Court in January (later known as Patterson Drive) where they rented office space from IOUE. The space was known as the “Kensington Court Labour Centre”. A new Collective Agreement was signed on June 2, 1988 with Addiction Services. A tentative agreement reached on June 30th with the General Hospitals and School of Nursing was rejected by the membership. Talks continued with the assistance of a conciliator over the next several months. The first AGM was held on October 4, 1988 at the Charlottetown Hotel. The primary focus of activity was negotiations. The Souris Hospital and Community Health Centre was officially opened on January 14, 1989. The six million dollar project employed 22 RNs on a full-time, part-time and casual basis. A Collective Agreement, ratified by 58% of the membership in the General Hospitals and School of Nursing, was signed on February 23, 1989. Staff shortages, salaries that fail to recognize the value of the job, poor working conditions, lack of respect and powerlessness in the decision making process were issues of primary concern to the membership addressed in the Agreement. Union leaders began meeting with representatives from the PEI School of Nursing to discuss the eventual school closure. In May of this year, the Union was in initial discussions with nurses at Sacred Heart Home. The nurses there had approached the Union about joining. President, Sandra MacLean was appointed to the Industrial Relations Council of PEI in late Spring of this year. The first major undertaking was a review of the Labour Act. Maria Ward, a PEINU member, was elected as the National Federation of Nurses’ Union (NFNU and now CFNU) Vice-President at the Biennium Convention in Edmonton. Numerous meetings were held with government departments over the summer months to discuss concerns. Some of the issues included quality of work life and quality of patient care, ongoing education for nurses, the decline in the nursing profession as a desirable career, and improvements needed to maintain the quality of the Island’s health care system. Membership in 1989 consisted of 700 RNs in 9 Locals including 7 general hospitals, the PEI School of Nursing and the Addiction Services units. A Nursing Forum held on October 13th and 14th was a result of ongoing meetings with representatives from the Hospital and Health Services Commission, the Association of Nurses of PEI and the PEI Nurses’ Union. It included nurses from acute care, public health, home care, extended care and nursing education. They met regularly to discuss issues of concern to nurses. The group determined that professional nurses should be the ones to articulate their concerns. As a result, a Steering Committee was established to plan the Nursing Forum. Talks continued with staff at Sacred Heart Home and there was a hearing in January before the Labour Relations Board, as the employer objected to the Union’s application to represent the RNs. In February, PEINU was granted certification to be the Bargaining Agent for staff nurses employed at the Sacred Heart Home and 20-30 nurses became members. Preparation began in March to negotiate the first Agreement. The Union was actively involved in the Pay Equity process at two separate tables – the General Hospitals and School of Nursing; and Addiction Services. A new Collective Agreement was negotiated in May, 1990 with Addiction Services. At this time, PEINU began to negotiate a first Collective Agreement for the new members at the Sacred Heart Home with the Employer. A Joint Committee representing the Union and Management was established. The mandate was to gather and analyze data and information on the following: shift premiums, week-end premiums, specialty pay and responsibility pay. Four PEINU members sat on the committee: Dorothy Blackadar, Darlene Horne, Heather Sherren, and Beryl Chandler. PEINU cost-shared with the other Atlantic Provinces to do a mini television series called “Recognition and Respect: Canadian Nursing in Transition.” The series aired on five consecutive Sunday evenings, each being 30 minutes long. This increased public awareness of the nursing profession, past and present, and the very serious concerns nurses were attempting to deal with. Membership in 1990 consisted of 700 members in 10 Locals which included 7 general hospitals, the PEI School of Nursing, Addiction Services Units and the Sacred Heart Home. In April, there were further discussions about the closing of the PEI School of Nursing as it was more imminent. PEINU worked closely with the staff of the PEI School of Nursing and Government representatives in preparation for the impending closure of the School. The first Collective Agreement for Sacred Heart Home was ratified in May. The process took a very long time for a very small, but very committed group of nurses. Negotiations for the Hospitals and School of Nursing were ongoing and the Agreement was eventually ratified. It was an active year for the PEINU, with continued involvement in activities such as Pay Equity, negotiations for the Addiction Services and the Sacred Heart Home, and commitment to the NFNU. PEINU became an active participant in the reform process for the province’s health care delivery system. The Job Evaluation process was completed. Representing all of the employers at this time was the Health Negotiating Agency (HNA). Preparation was also underway for the negotiation of a new Collective Agreement between the PEI Nurses’ Union and Addiction Services. Salary increases were negotiated with the Sacred Heart Home in accordance with a wage re-opener provision. The Education Fund began July 1, 1992 with $150 available annually for each member. A committee with representation from PEINU and HNA was established. The purpose of the committee was to allocate and administer the funds designated in the General Hospitals and School of Nursing Collective Agreement. A Nursing Advisory Committee to the Minister of Health was formed which came out of a recommendation from the National Nursing Symposium that was held in Winnipeg in November, 1990. Health Reform & Primary Health Care meetings took place. This was the start of a health system reorganization – one of many over the past few decades. This led to Work Force Adjustment which meant some older nurses took retirement packages, some saw reduction of hours and there were some layoffs. PEI hosted Eastern Labour School this year. A highlight during Labour School was the participation of students and instructors in a rally held in front of the Shaw building as nurses joined in solidarity with other health care workers to request that government “Leave the Care in Health Care”. Membership was at 725 members made up of 10 locals which included 7 General Hospitals, the PEI School of Nursing, Addiction Services and Sacred Heart Home. PEINU signed a Pay Equity Agreement in January. This was another long process. It was an attempt to give women equal compensation to men – equal pay for work of equal value. 1994 was a year of disillusionment and upheaval for the Union. Bill #70 Labour Reduction Costs was introduced on May 14, 1994 and passed into law on May 19th. This meant a 7.5% pay rate reduction in the Public Sector for pay rates of more than $28,000. PEINU was the only union to have all of its members hit with the 7.5% reduction. As a result of Bill #70, the six affected unions formed a Coalition – PEINU, CUPE, IUOE, PEITF, UPSE and IBEW. There was a real movement toward public sector unions working together. The Labour Coalition held 4 successful rallies at the Provincial Legislature, a protest at CP Prince Edward (now the Delta Hotel) when the Liberal Party hosted a $1,000/plate lobster dinner, conducted polls, media campaigns and a canvass of PEI businesses with a request that they display the 7.5% reduction sign to support the Unions. The message was that such a reduction would hurt everyone. The Coalition challenged the existence and need of the Royal Commission on Public Sector Labour Relations and voted not to participate in the Royal Commission. The Union faced the greatest challenges ever encountered up until this point in time. There were many uncertainties and unanswered questions. The need for collective action and mutual support was integral. The last class at the PEI School of Nursing graduated this year. On June 30, 1995, Sacred Heart Home closed after 40 years and nurses received severance pay. These members had been a vibrant part of the membership. Many found work in other areas including long term care in both the public and private sectors. Public Sector Pay Reduction Act legislation expired on May 16, 1995. July, 1995 brought significant jurisdictional changes. About 30 nurses were transferred from PEINU to UPSE (Head Nurses, General Supervisors, Nursing Supervisors and Department Supervisors). About 220 Nurses employed in long term care, public health, home care, community mental health and Hillsborough Hospital came from UPSE to PEINU. As a result, membership increased to approximately 900. The Union was restructuring to meet the needs of its changing membership and undergoing transitional changes involving benefits, payroll system and new locals. The position of President became full-time in October, 1995. This was due to the increased membership, the complexity of issues and increased demands on the individual in that role. 1. Collective Agreement between the General Hospitals of PEI and the PEINU. 2. The Agreement between Addiction Services and PEINU. 3. The Agreement between the Government of PEI and the PEI Union of Public Sector Employees. 4. The Transitional Agreement of July, 1995. Meetings for Classification Review were ongoing. It was difficult to compare salary scales from UPSE with those of PEINU. There had to be an objective review of seniority lists because UPSE used years of service and PEINU used hours of service. The PEINU membership voted unanimously to disaffiliate from the NFNU on April 24, 1996. Financial considerations factored into this decision. Classification Review was still ongoing. The Union undertook to have an organizational review. It was growing and there were some internal issues. The Union was continuing to deal with complexities surrounding scheduling issues in the worksites and was addressing seniority issues. Membership was in excess of 900. PEI hosted Eastern Labour School from May 12-14th. A new Collective Agreement was signed on December 10, 1999. Classification Study Results – review completed. Negotiations, Classification, the Nursing Shortage, Recruitment and Retention Strategies, as well as Local and Provincial issues consumed a significant amount of time and energy. PEINU re-affiliated with the Canadian Federation of Nurses’ Unions (CFNU) on January 1, 2001. Through this, the Union also became affiliated with the Canadian Labour Congress (CLC). This was another very challenging year and the Union was constantly inundated with Employer requests to let them try something different. It was evident that the nursing shortage and retention issues would not be resolved in the immediate future. It was imperative to move forward and ensure that nurses’ issues were carefully articulated and understood by the public with the onset of negotiations. Many political lobbying initiatives and PR activities took place during this year. Talks broke down on May 24, 2002 and a second round of TV ads was launched about recruitment and retention. Nurses met with MLAs. An Ipsos-Reid poll conducted showed that Islanders clearly wanted the government to take better care of its nurses. The media followed the nurses’ struggle with negotiations and through conciliation on July 12th. Conciliation failed and the nurses were called back to the table. On July 18th a Tentative Agreement was reached. It was ratified on September 12, 2002 by 82% of the voting membership and more than 70% of the membership voted. In September of this year, a Collective Agreement was signed. This marked a milestone in shift differential and weekend premiums. PEINU had the best conditions in the country on these two fronts. There were 5 health regions and then two large acute care hospitals were pulled out to form one body – the Provincial Health Services Authority. There was a Ratification Vote on January 24th of this year on a letter of understanding containing provisions and amendments to the Collective Agreement required as a result of these changes. Southern Kings & Eastern Kings were merged. Reorganizations were plentiful around this time. Linda Silas becomes President of CFNU, replacing Kathleen Connors. The Prince County Hospital opened and this was a big deal for members. Betty MacFadyen retired after 17 years. She had worked hard to establish professional working relationships and effective communication with employers, government and members. She survived cutbacks, rollbacks, regionalization and restructuring on more than one occasion. As PEINU’s Chief Negotiator, she helped to achieve a benchmark compensation package of greater than 22% in wages and benefits. Eleanor Gallant became the new Executive Director. The PEINU website was created in order to better communicate with members, report on negotiation process, serve some of the Union’s PR needs, provide an on-line version of forms and provide the Constitution and the Collective Agreements electronically. All Health Regions were disbanded and the Department of Health became the sole employer for all health sector employees. Government offered RNs incentives to leave the profession at a time when the PEINU Negotiating Team was seeking incentives to retain our experienced nurses. The Union felt they could not stay at the bargaining table when the goals were in opposition. Government was focused on budget deficits, downsizing and layoffs. Government cancelled any and all nursing recruitments, student sponsorships, sponsorship for refresher program, summer employment for BN students and the health care Futures program. Morale in the workplaces was disintegrating. A National Poll in June, 2005 indicated that the Canadian public saw ending the nursing shortage as a top priority. A telephone survey of members identified a number of major concerns that fall under retention, respect and Maritime parity. Kendra Gunn became the new Executive Director in June, 2006. The focus of negotiations was wages. Government’s primary focus was maintaining a specific wage increase in line with increases that had been occurring elsewhere in the public sector. A PR campaign was immediately launched by the Union, reminding government it was necessary for Island nurses to be paid wages comparable to their Atlantic counterparts in order to address the nursing shortage. On August 10, 2006, a tentative deal was struck that ensured PEINU members would receive wages on par with nurses in the Atlantic Region – 8.75% over 3 years from April 1, 2005 to March 31, 2008. The Negotiating Team also recommended ratification of the agreement that would see improvements to wages, benefits and contract language, including maternity/parental leave insurance top-up, compensation for senior nurses who mentor new nurses in the form of educational credits, increased employer contributions to the education fund and the long awaited arrival of Nurse Practitioners as new positions within the bargaining unit. The move to one employer (the Department of Health) put focus on the different practices in different worksites and geographic regions and forced the issue of provincialization of contract interpretations. Also, the five former Regional employers all operated under their own payroll systems. These payroll systems had to be amalgamated. Barbara Brookins was appointed as interim President and was later acclaimed to this position. The Clinical Information System (CIS) and formerly known as the “CERNER Project”, was designed to convert all health record keeping into electronic data, the project placed significant stress on many employees in the Department of Health. Many nurses indicated that their comfort level in operating the new system was very low. There was fear that this change in technology would have the unplanned effect of pushing those close to retirement out of the workforce sooner than they had planned. According to a member survey, work life and workload issues were identified as the number one priority in need of change. Much discussion concerning “scope of practice” led to numerous meetings with employers and government. There was anxiety over clarification of roles as LPNS were now able to administer medications in long term care settings. Acute care settings saw unregulated health care workers (PCWs) providing assistance in areas such as positioning, feeding and bathing patients. Many concerns were raised over this. These changes were occurring with little or no input from the Union. A new Collective Agreement was finalized on March 24, 2009. For the first time in the Union’s history, it proceeded to binding arbitration to settle issues that could not be resolved through collective bargaining or conciliation. The main reason it went to arbitration was a dispute over the pensionability of a new senior nurse retention incentive. PEINU wanted to be on par with all other nursing contracts in the country and have a provision that the wage adjustment be pensionable. There was much discussion surrounding the Employer’s new “Model of Care” as it was implemented in various work sites. Patients were presenting with more complex health issues and the acuity in both acute care and long term care was creating many new challenges. One of the big concerns was that the nurse/patient ratios had not been adjusted to reflect this change. The “Research to Action” project was being championed by CFNU and PEINU with government funding. This project developed continuing education in areas of skill shortage; more specifically the implementation of a PEI based Critical Care and Emergency Nursing Program. Frustration with government was increasing. They appeared to listen to concerns, but the decisions they made in relation to health care delivery did not reflect the same level of understanding and respect for Registered Nurses. They didn’t work on “Island made solutions” – working together to find solutions. Instead, they accepted direction from external organizations that had no ownership in how the changes would affect Islanders. PEINU spent most of the year preparing for the rollout of the MOC in 4 showcase units. Mona O’Shea was elected President in May, 2010. Health PEI was newly established – a Crown corporation that would take over management of the delivery of health services in the province from the Department of Health. All but a few of PEINU members would transfer to the new employer. An arbitration would address issues of the few RNs who would remain under the Department of Health. In late February, the union relocated to its new office building on 10 Paramount Drive. This new space brought opportunities for growth and education to the membership. PEINU developed a MOC Committee to deal with the numerous issues arising out of the MOC changes. The committee was instrumental in negotiating conditions for continued employment for RNs impacted by staffing reductions. Unregulated allied health care workers started working in acute care settings for the first time ever. Nurses continued to struggle with workload issues, MOC changes, and excessive overtime. The Research to Action project was successful, seeing 17 RNs obtain certification in Critical Care and Emergency Care Nursing in 2010. Proposal for continuation of the project was presented to Government in early November, 2010. This would see PEI having a Critical Care and Emergency Care Nursing Program. Members would no longer be required to travel off Island to take the course. Wage Re-opener arbitration in December, 2010 resulted in PEINU members receiving a 2.5% wage increase for the 2010-11 contract year. A new contract was ratified in the Fall of 2011 which included no lay-off provisions for the term ending March 31, 2014. PEINU hired a new Communications Education & Research Officer to assist with both internal and external PR, membership, education and research support. The position became permanent on June 18, 2012. Union’s leaders from across the province embarked upon a strategic planning for the organization. The process helped determine the direction for the Union over the next few years and lead to some new and improved services for the membership. The PEINU collective agreement did not expire until March 31st, 2014 – but preparation for the collective bargaining began in the Fall with the selection of the Union’s Negotiations Committee. In the past few years, collective bargaining processes involved public sector Unions across the country being under attack by Federal and Provincial governments. The Federal Ministry responsible for Labour established a pattern of legislating Unions back to work and imposing contracts when faced with strikes that cause any apparent inconvenience to the general public. Some provincial governments were interfering in the right of Unions and “arm’s length” employers such as Health Boards or Regional Education Boards by imposing new contracts and by creating new labour legislation that would curtail the power of arbitrators to award wage settlements that are not approved by governments. PEINU moved forward in its 25th year representing front line public sector Registered Nurses and Nurse Practitioners in the province. Over the previous decade, the size of the nursing workforce and the demand for RNs by health care systems led to contract language and wage incentives that assisted in recruiting and retaining nurses. Universities could not graduate a sufficient amount of RNs fast enough. Employers offered numerous enticements to both experienced and new RNs to try and fill vacancies that were too numerous to track. And then the tide turned. In the last 5 years, governments across the country recognized they needed to get a handle on ever increasing health care budgets. At the same time they were faced with a shortage of RNs. Health care employers started deleting existing RN vacancies they couldn’t fill, and starting hiring less expensive allied health care providers who could be trained in a fraction of the time. The deletion of RN positions due to the employer’s implementation of its new model of care continued to occur at worksites and units across the Island. Promotion of white/black for easier identification began. PEINU took a proactive approach in trying to help the membership re-establish the visible identity in the workplaces. The mandatory conciliation process concluded and no agreement was reached. PEINU views were to focus on keeping pace with other nursing union counterparts in Atlantic Canada for an appropriate wage increase. Wage rates in NS, NB, NL outpaced PEINU rates significantly. The Island experienced the exodus of UPEI nursing graduates. The employer was posting a number of permanent positions, postings were going “open to public” and the PEINU membership had options to move around in the system in ways other than through temporary positions. The tide was turning in terms of the impact of reductions of front line RN positions through the employer’s Model of Care initiative. They system was beginning to see the light at the end of the tunnel. Some units and worksites who implemented the model had seen increase in RN positions. The number of retirees was on the upswing. PEINU’s new strategic plan entitled “Safeguarding Nurses; A Welcoming Harbour” set out the direction for the next three years (June 2016-July 2019). Health PEI hired over 50% of the graduating class from UPEI through the two sponsorship agreement. For the first time, the employer recognized the need to recruit and retain nurses in PEI. Discussions were made with Federal Members and Provincial Ministers, in collaboration with CFNU, to provide the evidence based research indicating the necessity for the National Pharmacare program. The term of the Collective Agreement continued through the year and concludes March 2018. All members saw two pay increases throughout the year. There were still many RN vacancies across the Island. Health PEI developed a second Return to Service (RIS) for nursing students. However, the new agreement had no dollar value. PEINU predicted the shortage would eventually happen following the introduction of the Model of Care initiative, which resulted in the elimination of numerous front line acute and long term care RN positions from the system. In combination with the creation of the provincial nursing strategy, the Secretariat office for Recruitment and Retention is keeping a watchful eye on retirements, how many nurses are graduating, how many nurses are leaving PEI and the reasons, and how many RNs they will need to keep the health care system functioning. PEINU delegates participated in the CFNU Biennium travelling to Calgary, Alberta. Many units, worksites and services are dealing with nursing shortages. Members are experiencing the impacts of the employer’s inability to backfill record setting permanent and temporary vacancies. Health PEI indicates the system has no fewer than 100 vacant RN positions. The Union has issued a Notice to Bargain to the employer at the end of January. – In the beginning, there were no shift differentials, weekend premiums, health and safety provisions, paid parental leaves, etc. – In 1974, RNs on PEI were making $150 bi-weekly. An RN Step 1 was making $4.03 per hour. Overtime was defined as any work performed while on vacation in excess of 7.5 hours. – In 1975, Canada Manpower had 13 nursing positions available in Canada. – In 1976, the money raised by RNs selling tickets on a black & white television was used to fund the Education Fund. – PEINU’s office became computerized in April, 1996. Marjorie Ferguson was the Executive Assistant until 2002. Lorna Donovan succeeded her and has been with the Union ever since.